Greens Farms Academy libero Alex Nason, a resident of Darien, bumps the ball to a teammate during the Dragons' win over Forman on Saturday at Coyle Gym in Westport. The fall sports season at Greens Farms Academy got off a great start as the Dragons didn’t lose a contest in first full week of play. The Dragons girls soccer team opened the season with three straight wins, girls volleyball won a pair of games and the boys soccer team earned a hard-fought tie with New England power St. Andrew’s of Rhode Island. The Dragons opened the 2018 season with a 5-1 win over Christian Heritage School on Tuesday at Indian Ledge Park in Trumbull. Senior Sophia Staeger (Southport) scored twice in her return to the GFA varsity squad. Elyse Kimball (Westport) also tallied a goal while senior Lilah McCormick (Westport) and sophomore Georgie Grabowski (Stratford) scored their first-ever career goals in the second half. Kimball and Annika White (Southport) tallied assists. Marygrace DelliSanti (Wilton) had a pair of saves. Dellisanti made six saves as GFA shut out Holy Child to notch their second straight victory to open the season with a 2-0 win on Thursday in Rye, N.Y.
Kimball and Ava McCormick (Westport) scored goals for the Dragons. Kimball scored two goals to lead the Dragons to a 2-0 win over Ethel Walker on Saturday. Julia Edwards (Westport) assisted on Kimball's first goal, which staked the Dragons to a 1-0 lead just six minutes into the game. Staeger set up Kimball's second tally, coming in the 79th minute, to cap off the win. Freshman Lane Murphy (Darien) started the game in goal for GFA with Dellisanti coming in during the second half. The paid made one save each. The Dragons opened the season with one of their biggest regular-season wins in a long time, stunning Sacred Heart-Greenwich by a 3-2 score at Coyle Gym on Thursday afternoon. Kirwan Carey (Westport) had 15 kills, 11 blocks, six digs and three aces in a monster game for the Dragons. Elena Mota (Darien) added 12 kills and four digs while Kristiana Modzelewski (Westport) had a five blocks. 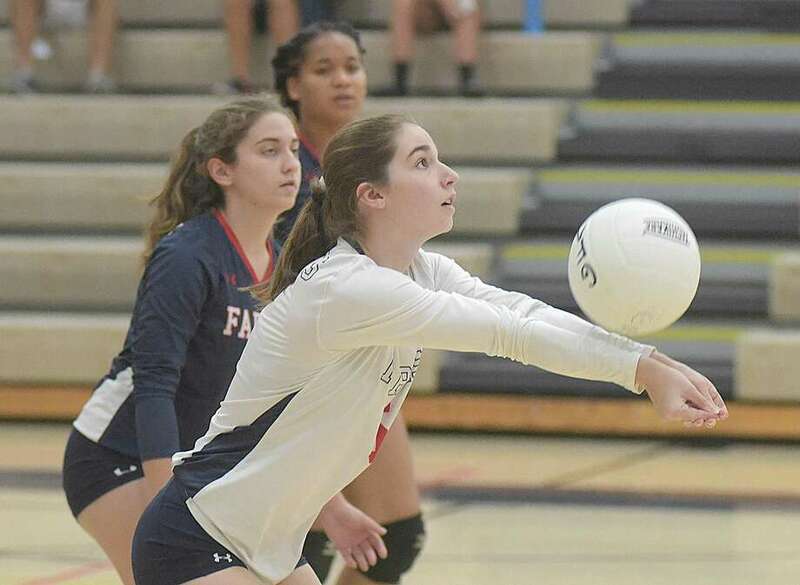 Alex Nason (Darien) led the defensive charge with 11 digs while Meg Nesi (Fairfield) tallied 23 assists. Cayla Bernstein (Norwalk) added five kills while Nesi chipped in four more. The Dragons got off to a fast start and rolled to the sweep of Forman School on Saturday. Carey had 15 kills and six aces for GFA while Nesi had 12 assists and Kelly Mooney (Southport) added six setups. Nason had five aces while Leah Attai (Bridgeport) had four. The GFA offense started off with a bang with five quick, offensive penalty corners in the first four minutes of play. GFA kept putting pressure on the Millbrook defense with shots from senior midfielders Bryn Morrison (Weston) and Lucy Holzinger (Westport). The pressure forced Millbrook to call a timeout, but just seconds after play resumed, Holzinger got the ball in play to sophomore forward Zoe Koskinas (Fairfield), who in turn found senior forward Francesca DeVita (Darien) and she got the Dragons on the board with 19:29 left in the first half. DeVita responded with a second goal just under a minute later at 18:09 with a pass from sophomore forward Keely O'Shea (Darien). Koskinas followed with her first goal of the season at the 13-minute mark off a pass from Holzinger. O'Shea added her own goal at 7:23 on a fast break from Holzinger, tipping the ball right past the goalkeeper. Millbrook scored a goal before GFA answered immediately with goals to end the half. The first from Holzinger, off a penalty corner at 3:02, and another offensive Koskinas, who beat the Millbrook goalie one-on-one with one minute remaining in the half. Goalie Nikki Farber (Westport) made six saves on eight Millbrook shots. Sophomore Caroline McCall (Westport) placed 31st out of 166 varsity runners to lead the GFA Dragons charge at the Wilton Invitational on Saturday. McCall ran the 4K course in 16 minutes, 41.03 seconds. Sophomore Haley Nilsson placed 43rd in the varsity race in 17:12.16. In the boys varsity race, a 5K affair, Larson Palmgren (Fairfield) placed 123rd in 20:49.02. Charlie Bohnsack of Darien) (20:52.28) and Will Magrone of Darien (20:58) were right behind. Owen Minson (Darien, 22:56), Oliver Diamond (Rowayton, 23:23.74) and Ben O'Brien (Stamford, 23:51.12) rounded out the varsity efforts. The day began with the girls freshman race. Georgia Palmgren (Fairfield) placed 33rd and Katie Gabriele (Westport) was 50th with times of 10:55.81 and 11:35.55, respectively. In the boys freshman race, Connor Minson (Darien) posted a top 10 finish with a time of 8:39.51 over the 2,500-meter course.